It’s a good thing we are still 10 days out. Things can change. The current forecast for Ramble Saturday is for 35 degrees in the morning, a high of 49 degrees, wind from the north at 11mph, and a 60% chance of showers. In the prior two editions of this event we’ve not had to deal with rain and muddy conditions. I’m not too eager for a cold, soggy Ramble. Rain and temps in the 35 to 45 range is not really fun for me, and could land me beside my fireplace. Oh well. I haven’t given up on my “which bike should I take” deliberations. I’m counting on this long range forecast as being pretty much a wild guess. 10 days out is a pretty long time, and it seems like weathermen hedge their bets on precipitation. If it's a 20% change they'll call it showers because no one gets mad at them if the rain doesn't come after all.I'll probably be riding the Nishiki hybrid again. It has drop bars now. Very glad to hear you are planning to return. Go figure? All that heat and drought you had this summer and now it's supposed to rain on the one day you schedule the Ramble. I'd be there if I could. But alas, I'll be in the Chicago area for our annual early Chrsitmas celebration with my in-laws. RonDog, wow I'm old. Thanks, now fixed…back up to date. Looks like our weather the past 3 weeks, and honestly I wouldn't be too excited to ride either. I'm sort of done with 40F and raining. First, I've decided to ride with you. Have been trying to install fenders but they won't work with the 700×32 tires. 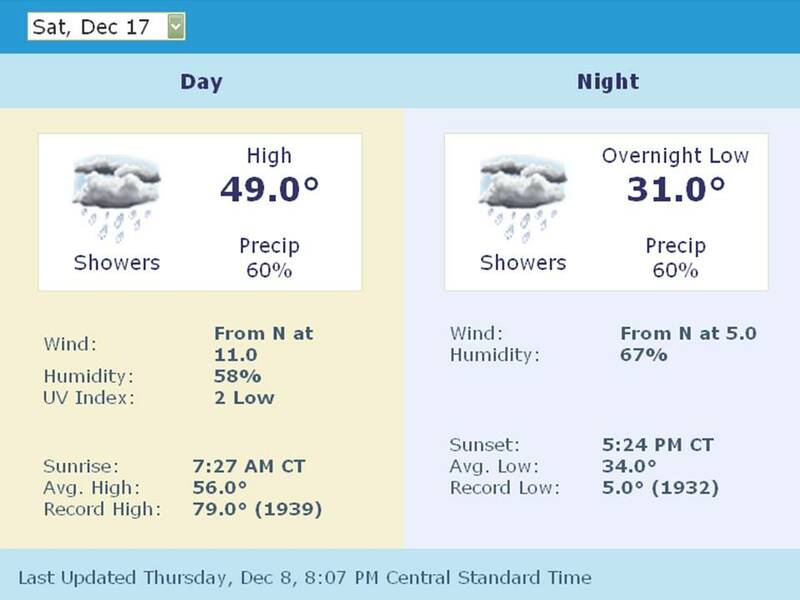 Oh well.Dallas forecast from 10 to 3 on Saturday is 49 to 53 degrees, 11 to 13 mph NNE and 30% chance of rain. John, great news! I hope we don't get enough rain to cause you to regret your decision.The temps forecast is now increasing, but the chance for rain is holding at 40% in Sanger. Intellicast sez: Saturday, December 17- Times of sun and clouds. Highs in the low 50s and lows in the low 40s (for Sanger).I just realized I haven't mentioned this to the wife yet. I need to make sure I don't have other plans I don't know about yet.